Bodikhuu is a producer and hip-hop obsessive from Ulaanbaatar, Mongolia, the world’s coldest capital city. He works as a crane operator and dreams of Brazil. 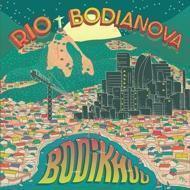 A lush, tropical album of Brazilian inspired hip hop beats from Mongolia. Notes from Bodikhuu in Mongolian and English on the back of the cover. 140g black vinyl.